Today’s breakfast lamb recipe is in partnership with the Lamb. Try it, Love it campaign. If you like this one, why not try my Greek lamb meatballs for an easy packed lunch? When I first mentioned to Belle that I was going to make up a breakfast recipe using lamb, she was sceptical. I paused for her to tell me what I genius I was. Silence. She’s 16 though, I don’t think it was a reflection on my idea. The thing is, I could see where she was coming from. When I first considered lamb for breakfast I wasn’t sure either. The more I thought about it though, the more it felt like an untapped source of breakfasty meat goodness. We have no problem eating pork for breakfast do we? Bacon, sausages, black pudding – it’s all good. Steak and eggs isn’t unheard of for a hearty brunch, so why not come up with a tasty breakfast lamb recipe? Plus there are environmental and health benefits to consider – lamb is a lot more sustainable than most other animal agriculture farming and it’s also one of the healthiest meats you can eat – it’s rich in niacin and vitamin B12 and a great source of things like protein, zinc, potassium and phosphorus. So there you go. 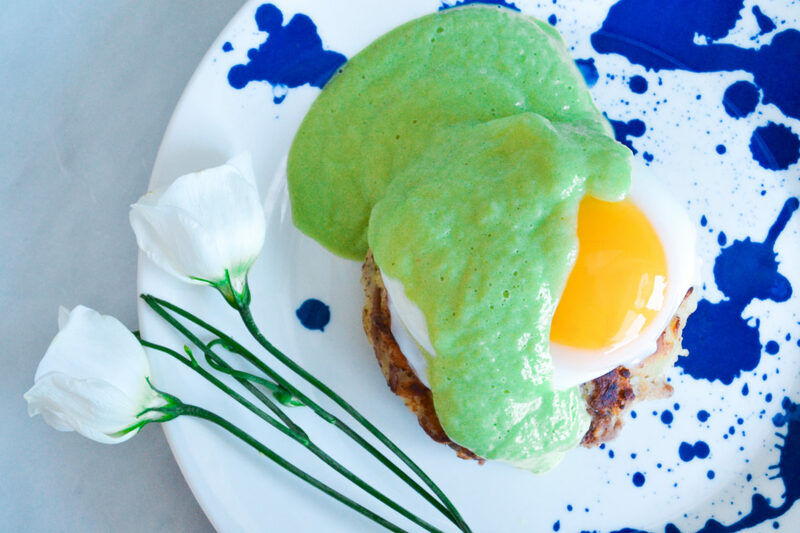 My green eggs and lamb recipe is pretty easy to make, although I’d suggest it’s more of a special weekend breakfast than a ‘we’re leaving in ten minutes godammit so find your shoes NOW!’ thing. It’s the sort of breakfast I imagine cooking up while listening to The Archers omnibus and drinking a big mug of fresh coffee. In fact, it would serve you very well as a Valentine’s Day breakfast – nothing says ‘I love you more than the cat, honest’ like taking your time over a special breakfast for someone. 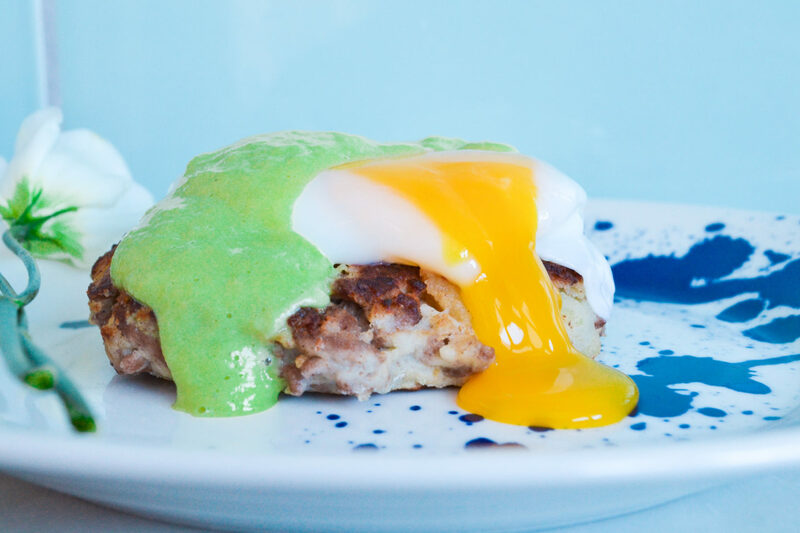 That’s not to say my breakfast lamb recipe is difficult, in fact, it’s possibly easier than your regular eggs benedict because the ‘green’ bit comes from a cheaty hollandaise-style sauce made from avocados, which is actually much easier than regular hollandaise. Your Valentine doesn’t have to know that though. 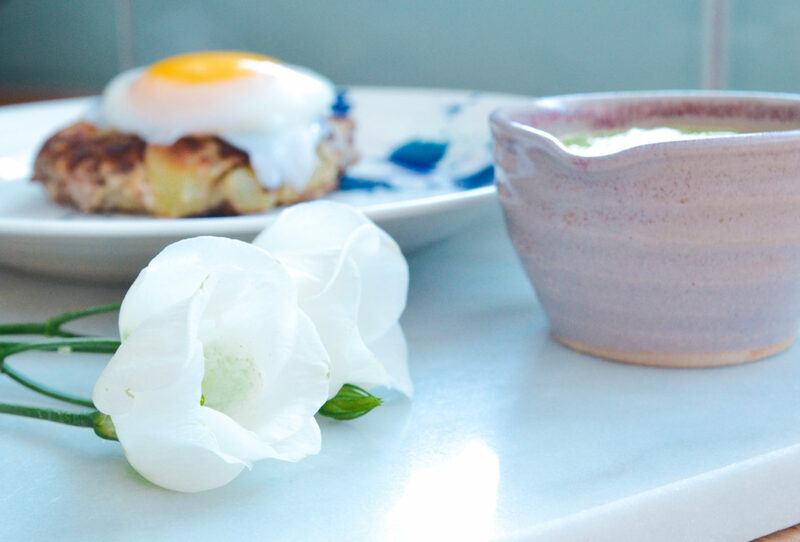 Chuck a flower on the side next to the plate and cue some much deserved swooning. 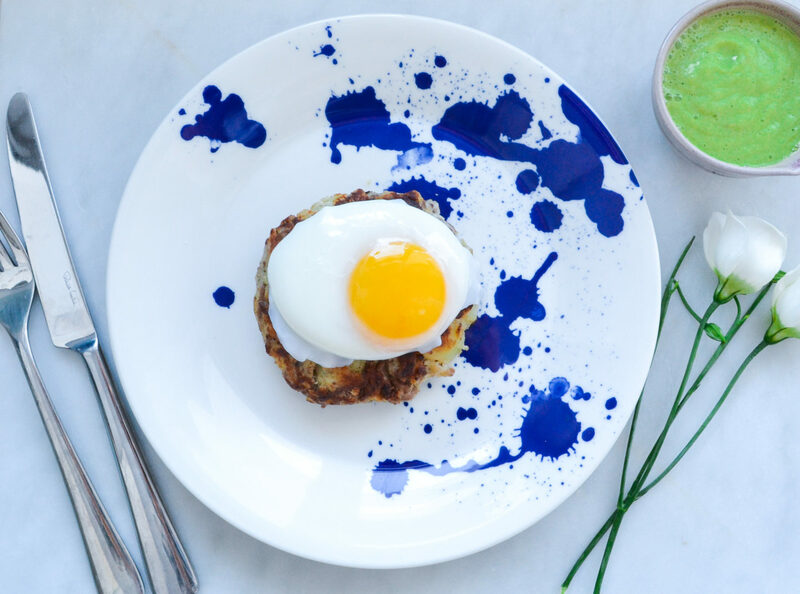 The base of my green eggs and lamb is a kind of lamb and potato patty – a bit like bubble and squeak, but with more lamb. Start by peeling and chopping your potatoes into small chunks – about a centimetre square is fine – and stick these on to boil for 10-15 minutes. Meanwhile fry your onion in the olive oil until soft, then add the lamb, all spice and cumin and fry until just browned. Drain the potatoes and add to a mixing bowl with the lamb. Stir it all up into a big mush and shape it into two burgers. The next stage takes a bit of coordinating, so at this point you might want to make the avocado sauce to get it out of the way. Put everything bar the water in a blender and puree. Add small amounts of hot water until you get a nice, smooth, pouring consistency. If you want to have the sauce warm, you can heat it gently in a pan for a few minutes. Back to the other bits. I’d suggest getting the eggs on, then frying the lamb and potato patties while they cook. I’ve always been terrible at poached eggs, but a couple of weeks ago I got a set of the Delia ‘How To Cook’ books in a charity shop, so I decided to have a go at her method for poached eggs. Start by putting an inch of boiling water into a heavy-based, wide pan. Heat the water until bubbles are JUST starting to form on the base of the pan, but only just – you don’t want the eggs getting shaken about. Break the eggs gently into the pan and simmer for exactly one minute. Then remove from the heat and leave them sitting in the water for exactly ten minutes. Oh how it oozes with yolky deliciousness! I’d recommend going for really good quality eggs so as to get a lovely bright yoke. If you can’t treat your loved one on Valentine’s Day to a decent coloured yoke then what hope really IS there for your relationship? 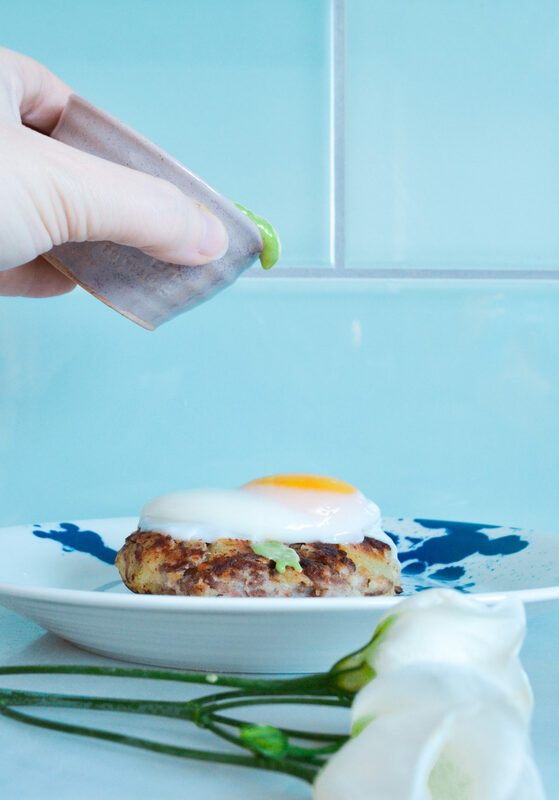 You can now either cover your lamb and egg in avocado hollandaise-style sauce or be fancy and serve the sauce on the side. Add the Valentine’s Day flowers and present the finished dish to your loved one. Find more lamb recipes with Lamb. Try it, Love it. Right?? It FEELS weird but then you think about it, and it’s really not! 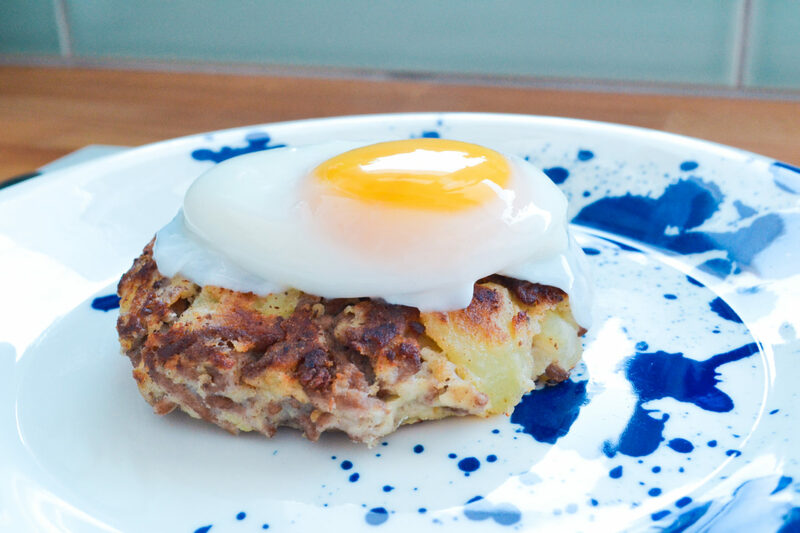 Anything that involves fried potatoes and runny egg gets my vote anyway.